There are numerous brand of tankless systems available to homeowners now. I always recommend Rinnai, as they have taken the time to train every installer on their product ensuring correct installation and increased reliability. 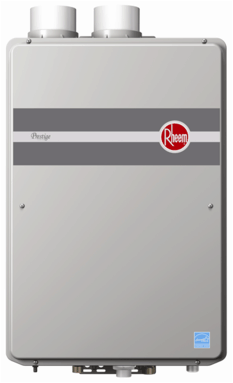 I have to add another brand to my recommendation list as RHEEM has built a great, durable, innovative tankless system. I was able to take a look at the new products that Rheem offers and I can say that these are top notch tankless water heaters. The condensing Rheem tankless uses a separate two pipe design enabling contractors to reduce venting costs and increase installation chances. The separate two pipes enable the intake air to be in one location while the exhaust can be routed to a completely different spot. These systems are ideal for our climate here in Ontario. If you don’t already know a tankless has to be properly sized so that it can adequately heat up sufficient water in the winter. Incoming water temperatures for us here in the GTA and Golden Horseshoe can be as low as 3 or 4 degrees. This means that we need powerful tankless systems capable of raising our winter water temperatures to your desired temperature. Rheem provides 4 main tankless systems that are sufficiently capable in this task. Interested In a Rheem Tankless For Your Home?